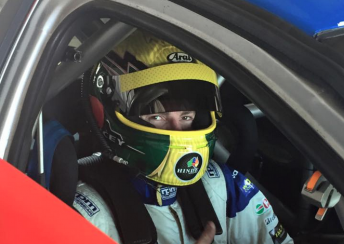 Ben Grice, the son of two-time Bathurst 1000 winner Allan, has enjoyed his maiden laps in a V8 Supercar today at Winton. The 24-year-old completed a brief hit-out in Matt Palmer’s ex-Brad Jones Racing Kumho V8 Touring Car Series Ford ahead of the weekend’s Shannons Nationals event. 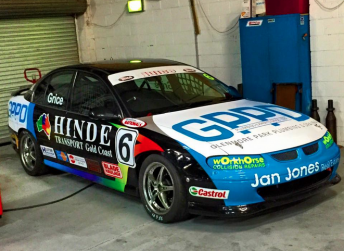 Currently running his own sign writing business on the Gold Coast, Grice is determined to forge a career in motorsport as a driver despite a late start. Dabbling in speedway before embarking on the Suzuki Swift Series in 2013, Grice made the move to the Super Six Series last year and is now competing in a Palmer-owned Holden. Grice hopes to progress to the Kumho Series as soon as the final round of this year, providing that a budget can be found. “Matt has been at me for a while about getting a budget together to run his second Kumho car and today was a bit of a taste,” Grice told Speedcafe.com. “Matt is racing the car tomorrow so I didn’t want to throw it off the road and I was pretty reserved. “But I was within a second and a half of him on the same set of tyres in the couple of laps that I did, so it was a pretty cool experience. Although having to build a career “off my own bat” meant that he did not race karts as a kid, Grice says his father is supportive of his racing efforts and will be on hand at Winton this weekend. The duo will be joined by veteran engineer Les Small, who is working with Ben this year after proving a Bathurst-winning combination with Allan during the mid-1980s. “The old boys have got the band back together and it’s pretty good for me having all that feedback and knowledge to bounce off,” said Grice. “I have a lot of respect for Les as well so I don’t really argue about set-up, I just listen, do what I’m told and hopefully let the results come. “My goal this weekend is to win these two one hour races. Read more… Source by SPEEDCAFE.COM.